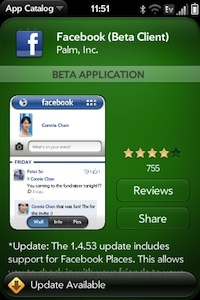 To install the beta version of the Palm Facebook client, you must first install two pieces of software: WebOS Quick Install on your PC, and Preware on your Palm webOS phone. Once you have WebOS Quick Install loaded on your Palm webOS phone, you are ready to install Preware, which is a fairly easy task when you use WebOS Quick Install. After you have installed Preware and launched it on your webOS phone, you can search for Facebook and find the beta client. You install apps in the Palm beta channel the same way you install applications in Palm's App Catalog and you're ready to rock-n-roll. To check for future updates to the beta Facebook client, launch Preware on your Palm every now and again and check the Updates section of the Preware screen. Sure, this all sounds really geeky and strange if you haven't played with Homebrew apps on your Palm Pre or Pixi before, but it is really easy to do and opens the door to hundreds of great app that aren't available directly from Palm.